Possible line-ups: Northampton (4-4-1-1): Cornell; Goode, Taylor, Pierre, Buchanan; Hoskins, Turnbull, Foley, Powell; O’Toole; A Williams. Newport (3-4-3): Day; O’Brien, Poole, Demetriou; Willmott, Labadie, Bennett, Butler; Matt, Azeez, Amond. 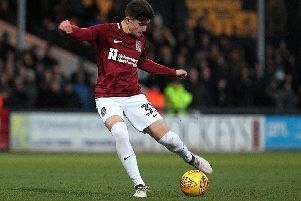 James Heneghan’s preview: Such is the dramatic way things have changed in the past few weeks, there’s every possibility the Cobblers could leapfrog Newport County when the two come face-to-face at the PTS tomorrow evening. It’s been a quite remarkable transformation bearing in mind it was only a month or so ago when all the talk was of avoiding a relegation battle. Just the mere mention of the play-offs would have been scoffed at. That prospect is hard to believe given the positions the two teams were in following November’s reverse fixture at Rodney Parade. Newport’s comfortable 3-1 victory almost four months ago lifted them up to fourth and took their points tally to 35, outside the automatic promotion places on goal difference only and a hefty 13 places and 12 points above the Cobblers, who were stranded in the lower reaches of the division, still not out of the relegation woods. And yet tomorrow night the two sides will swap places should Town emerge victorious and make it four wins in a row. Not only are Northampton resurgent, the Exiles are running out of gas. It seems another magical FA Cup run has taken its toll on the South Wales outfit who have gone from promotion challenges to desperately hanging on to a top half place. Conquerors of Leicester City and Middlesbrough following last season’s win over Leeds, County’s cup form has deserted them in the league, with just four wins in 16 games to their name since disposing the Cobblers. So while their play-off hopes have gradually diminished, Town’s have only grown and another three points on Tuesday will only add to the feeling that Keith Curle’s men can really make a late challenge for the top seven. Indeed, they could even be in the top 10 come 9.30pm tomorrow should results go their way. That’s quite a remarkable transformation bearing in mind it was only a month or so ago when all the talk was of avoiding a relegation battle. Just the mere mention of the play-offs would have been scoffed at. It’s difficult not to think everything is falling into place for the Cobblers. After beating injury-ravaged Exeter City on Saturday, Newport County will turn up on Tuesday night a team in poor form and coming off a 3-0 beating at Colchester United only days earlier. They look ripe for the beating. So the door remains very much ajar and it’s vital Town keep momentum and confidence on their side. Three points on Tuesday would certainly do no harm.